Planning is a discipline that is broadly defined to include the organization and development of cities and regions in a sustainable way (economically, socially, and environmentally). For some people, the fact that every planner would define it differently is the root of the problem; for others, it’s what makes planning an amazing, inclusive, all-encompassing profession. Many people are uncomfortable with interdisciplinarity, intersectionality, and overlap. We live in a postmodern world where people often specialize in areas such as molecular biology, real estate development, and mechanical engineering, developing critical and very focused skill sets. Planning as a discipline has always run counter to that ideology. The roots of the planning field lie in urban and social reform, particularly in the areas of housing, workers’ rights and social justice, and public health. It has always been a discipline of disciplines; since the earliest days of the Town Planning Institute in Canada (founded in 1918), members of architecture, engineering or other professions could become planners. This is one reason why planners are uniquely poised to address many urban problems. Our provincial planning association, the Licensed Professional Planners Association of Nova Scotia, and PLANifax, a non-profit organization founded by two of our BCD alumni, Uytae Lee and Byung-Jun Kang, created this video to answer the question, "What is planning?" The American Collegiate Schools of Planning also has a video and other resources to help you determine whether planning is the right career for you. 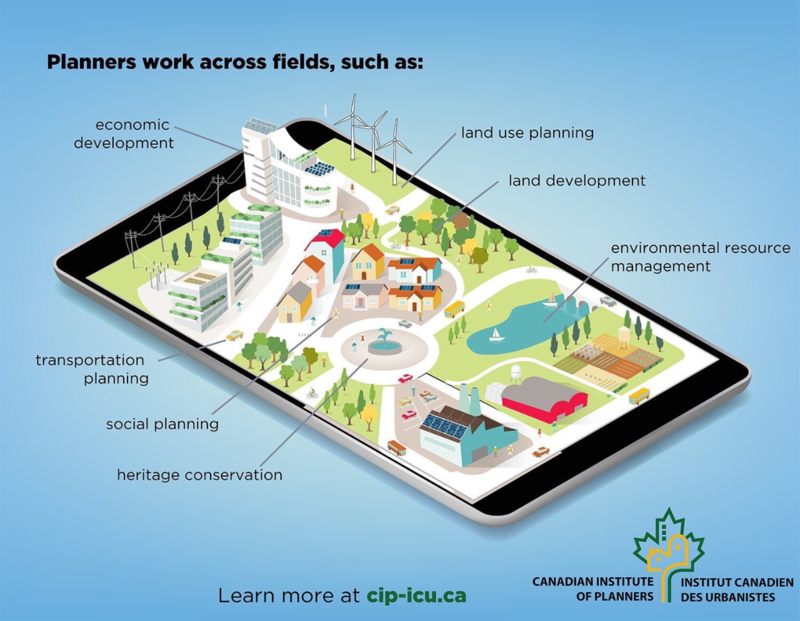 A planner is a professional who works with communities, governments, and individuals to improve urban and rural conditions. Planners work on a variety of different types of projects, such as developing urban design guidelines, reviewing development proposals, and developing community grants programs. They use skills such as policy analysis, facilitation of community meetings, GIS, data analysis, and collaboration with other organizations to produce documents such as project reports, briefing notes, official plans, and research papers. As planning educators, we foster these skills in our students so that they understand the planning framework and the spaces/times/opportunities for innovation and change. To become a registered planner in Canada, you have to complete an accredited degree in planning, gain appropriate work experience, and take a registration exam. It’s possible to become a planner without an accredited degree as well, with a longer work experience requirement and an additional exam. Planners work in a variety of settings in the public, private, and non-profit sectors, e.g. municipal government, planning and consulting firms, engineering firms, charitable organizations and non-profit housing authorities. Our BCD Honours and MPlan degrees are both accredited by the Professional Standards Board. Graduates are eligible to apply for professional certification and membership in the Canadian Institute of Planners and the American Institute of Certified Planners. A handy guide to the membership process can be found here. Students who choose to study planning are often interested in communities, organizations, and the environment. Generally, students who opt for a planning degree want to make their communities more sustainable, equitable, and efficient. Our students want to learn how to design streets that are safer for cyclists, develop outdoor education programs for youth in their community, or determine the types of land use policies that would make their city more sustainable. If you are a well-rounded student with skills and interests in ecology, civic or public administration, politics, cultural geography and history, and community engagement, you would enjoy planning. If you have done volunteer work in these areas, been politically active in your community, or attended meetings about urban development in your neighbourhood, planning is definitely for you!